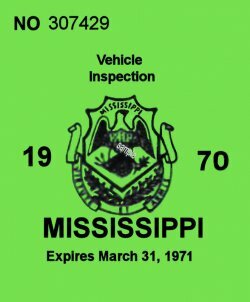 1970 Mississippi inspection sticker - $20.00 : Bob Hoyts Classic Inspection Stickers, Add a Final Touch to your Restoration! This is 1970 Mississippi INSPECTION sticker has been constructed from an old and mangled original. We have taken liberties in restoring and reproducing it based the Mississippi stickers that we have.